With certain films come certain expectations. 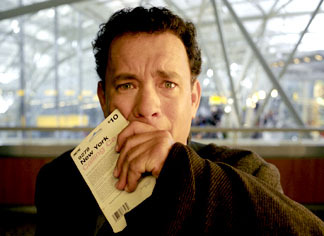 Directed by Steven Spielberg and starring Tom Hanks, The Terminal is one such film. Arguably two of the more reliable popular entertainers for quality filmmaking, Spielberg and Hanks's previous collaborations have ranged from outstanding (Saving Private Ryan) to decent (Catch Me If You Can). Unfortunately, The Terminal fails to continue this streak. Hanks plays Viktor Navorksi, a man who arrives in New York City only to learn that a war has threatened the existence of his Eastern European homeland. Without a proper visa or a home to return to Viktor is deemed "unacceptable" by airport security and ordered to remain within the walls of the terminal until further notice. Initially, this premise is delightful to watch  as Viktor teaches himself English and finds ways to make money, the film plays as a light and quirky comedy. When it tries to be more than that, however, The Terminal falls apart; the film becomes desperate to create sentiment and to feel "uplifting." The series of subplots feel shallow and seemingly pointless, especially the ones involving Viktor's love interest Amelia (Catherine Zeta-Jones, having a difficult time expressing emotion). And though it seems as if Spielberg is trying to make some sort of political statement (anti-government? ), it's not clear what this is and why he is making it.